The poodle was first called Pudelhund, a German word, which translates into English as “puddle dog.” They were first bred in northern Europe and were used to retrieve game from water. Most poodles today still love getting in water. The poodle became an enormously popular companion dog during the twentieth century, which led to the development of the miniature poodle and then the toy poodle. Poodles love people, tolerate children, and get along well with other animals, including cats. They make a great pet for almost anyone as they’re steady, loyal, active, and highly intelligent. They are also happy, loving and even-tempered; however, sometimes they can become a little needy and jealous. Poodles are so intelligent that they can seem almost human in their actions. Toy poodles weigh between 6 to 9 pounds and are up to 11 inches tall. 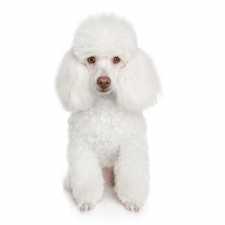 Miniature poodles weigh between 15 to 17 pounds and stand between 11 to 15 inches tall. Standard poodles weigh between 45 to 70 pounds and stand between 15 to 24 inches tall. The build of a poodle is slim but muscular. Their coats are wooly and curly and come in a variety of colors. The poodle’s coat doesn’t shed, and although no dog is said to be hypoallergenic, this dog won’t bother most allergy sufferers. Poodles are the 7th most popular dog registered with America's Pet Registry Inc. According to The Intelligence of Dogs, written by Steve Coren, the Poodle is rated as #2 under Brightest Dogs, which means it takes them fewer than 5 repeitions and they obey the first command 95 percent of the time or better.